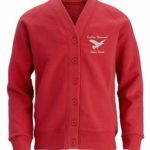 Our school uniform is based on the colours red and grey, which we encourage all the children to wear. We feel that it promotes a sense of identity within the school community and pride in belonging. Trainers for outdoor P.E. and Games. 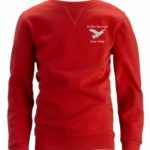 Sweatshirts, cardigans and polo shirts with the school logo can be purchased from Skoolkit in Fareham. They also have an online ordering service: Skoolkit and Marks and Spencer. All children are expected to wear sensible closed shoes in school and not open toed sandals, flip-flops or sling back shoes. Please also note that trainers are not accepted as daily footwear. Children may change their shoes when they enter the building from ones for outdoor use to footwear for indoor use. If you wish your child to change their footwear, we have shoe racks near every entrance where your child may put their shoes. We do not encourage children to wear boots all day in school, they may of course wear these outside at playtimes, but should bring a change of footwear for inside. Please provide your child with some protective clothing for use during art and craft sessions. An old shirt (worn back to front) would be suitable. All children will need a pair of trainers for outdoor Physical Education and field games. A change of socks is also required, this is very important during the winter months. These items of footwear should be kept, with their shorts and T-shirt, in a drawstring bag. We do not have cloakroom space for large kit bags. Specially named bags in your child’s group colour can be ordered from the school. Please use the order form at the back of this booklet. PLEASE MARK ALL YOUR CHILD’S CLOTHING WITH THEIR NAME, PARTICULARLY FOOTWEAR. Please do not let your children wear jewellery, including signet rings, for school. It really is inappropriate and they can easily become lost. If your child has pierced ears, they may wear plain studs. During P.E. and games, your child must remove and replace their own studs. During the first six weeks after first piercing, your child must wear a plaster over each stud or sleeper. Please provide your child with plasters for this. Should any of the above items be brought to school by your child and subsequently lost, the school cannot accept any liability. We are able to supply a number of articles of equipment from school. There are samples of all of the following available for you to see in the school office. We can supply a PE bag in the appropriate colour for you if you would like one. Please order as soon as possible. Large rucksacks and other bags are to be discouraged as our cloakrooms have very limited space and there is not enough room for the children to have several bags on their peg. The school will supply your child with the appropriate writing equipment and other stationery supplies. We will also supply your child with a named water bottle on entry to the school, replacement water bottles can be purchased from the office for 80p.